User, as the name suggests, is someone who uses the application. Simple so far, isn’t it? But just asUsers and groups in Nimbus RMS people are different and perform different roles, users too can be of many types. Based on what users can or cannot do, they can be categorized into different groups. For example, there can be a group of salespersons and all users falling within this group can be responsible for certain task/s like facilitating sales. Similarly another group can be of managers and users within this group can be assigned management of the store, and so on. Let’s get to know how user groups and users are created in Nimbus and how you can use them for the management of your retail store. 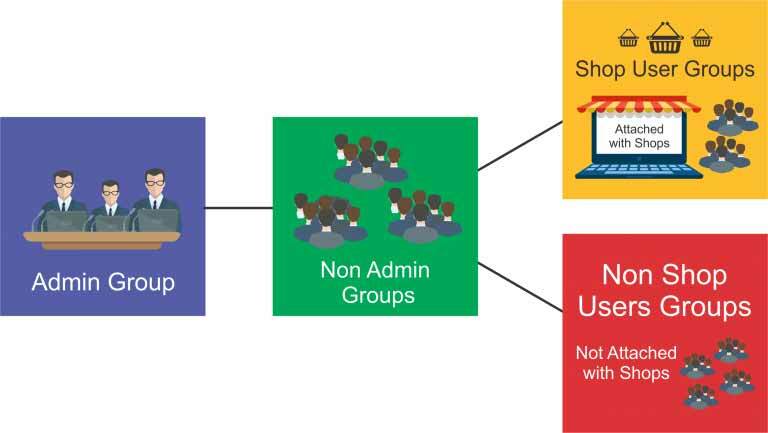 As explained above, user groups help categorize users according to their roles and responsibilities. The two predefined groups in Nimbus are: Admin & Sales Shop. You can also define additional user groups on Security>User Groups; all default and defined groups will appear in the Group menu of users screen. While defining users you will attach each user to a group depending on the user’s role. One important thing to remember about user groups is that group rights are assigned to groups and will be applicable to all users falling within that group. While creating an account in Nimbus RMS, you are required to enter your email, this email is treated by Nimbus as admin user email and the account associated with it as Admin user account. Remember there is just one admin group; no other created group can be given the status of admin. However, additional admin users can be created by assigning them to admin group. All users that fall within the admin group have by default all rights meaning they can access every screen and can perform all functions; they can access all HO controlled shops and work on them, and can view the records of autonomous shops. Admin group can assign and limit rights of other groups but no other group can revoke the right of admin group. Moreover, Admin users are non-shop users meaning no shop or shop register are attached to them. Non-shop user group: There is no limit to the number of non-stop user groups that you can create. Non-shop users groups could be sale and marketing groups, company managers, etc. Non-shop users are not attached to any particular shop and Admin can assign different level of rights to each group. Shop user group: There is no limit to the number of shop user groups that you can create. The users defined under these groups are attached to various shops. As far as the rights are concerned, there is no limit to the type and number of rights that can be granted to them by Admin. Shop users can be given all rights even the administrative ones but the rights will be restricted to the shops they are attached to. Shop users may or may not be attached to their shop registers. If a shop user is attached to a particular register of the shop then s/he can work only on that register. But if no register is attached to the shop user, s/he can work on all registers of the shop s/he is attached to. In any online inventory management software, other than group rights that apply to the entire group, there are certain individual rights that can be granted at the user level. For example, one user within the user group sales shop can have the right to edit price, while the other may not have that right. You can control all individual user rights on the security users screen. Don’t confuse employees with the users. While all users can be your employees, not all employees will be users. A user is only the one who can use the application, s/he will be given user ID and password to manage store operations on various Nimbus screens. For example, a sale person at a certain store is its employee and will be responsible for facilitating sales but s/he may not be a user. While the cashier who pings the sale, receives cash and prints the receipt is a user. The cashier can attach sales person name to the sales receipt for calculating sale person wise commission. Being able to categorize your users into different groups and assign their rights accordingly is very useful. This helps you streamline the various departments and tasks within your organization. If you still need any help with how to use and create users and user groups, you can talk to us about it in the comment section.